The new gOS operating system certainly would appear to up the ante in the ongoing war between the mighty Micro$haft and that pesky upstart Google. But is it any good and is it really Google? To find out, I just booted from the gOS liveCD I just downloaded. 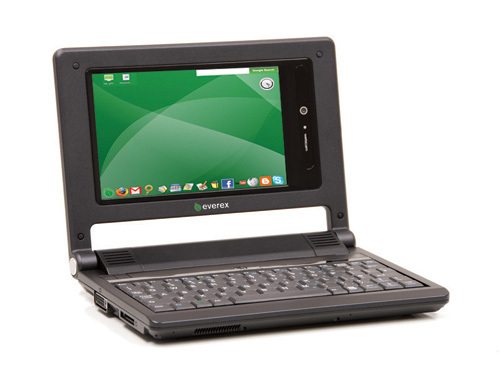 First impression is that it looks very nice, it's very Mac OSX-like and very green. 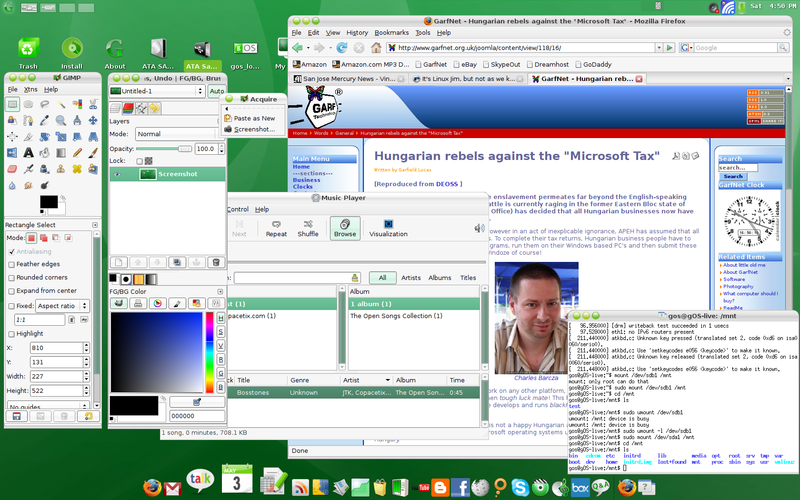 That is, green in the sense that the wallpaper, scrollbars and most of the icons are all green! 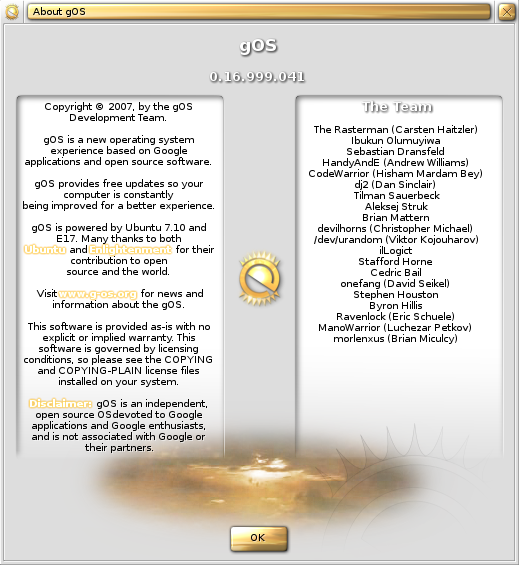 Rather than using a General Public License, gOS is licensed under a Creative Commons Attribution Noncommercial Share Alike 3.0 Unported license. 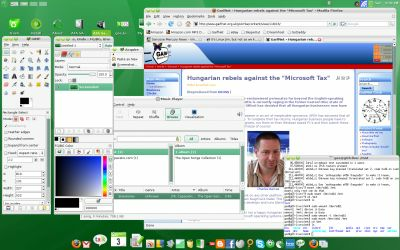 It borrows heavily from Ubuntu 7.10 and the desktop themes belong to a relatively new desktop manager called Enlightenment. You can run Enlightenment on standard Ubuntu too, of course (basically it does the same job as KDE or Gnome). But I never seen it look as pretty as this. Every word I am typing in this text-submission box thinks it's a spelling error! Shurely shome mishtake? Turns out that by default, the spelling dictionary for Firefox is Spanish! And you have to download the English dictionary seperately and restart Forefox. That seems pretty daft for an English-language release of a software product! It becomes even more daft bearing when you consider this is a liveCD and hence you have to do this every time you boot from it! The icon to open my existing hard disk opens a window for a second then crashes. Means you have to mount your HD manually (by typing the command "sudo mount /dev/sda1 /mnt" and hitting return). That is not smooth at all - though I guess the problem disappears if you actually install gOS on your hard drive. Took ages to find a terminal window. OK I know there is a trend to keep the user away from the command line. But experienced Unix users will not like this at all. Seems you have to hit the "G" button, click "Run Command" and then type in "xterm" (the only one I could find). But xterm is a rather crude terminal and I would have liked a better one, easily available from a menu. The very pretty Bling Bling theme has a bug when trying to display folders on a hard drive. Basically it cannot display more than one row and just overlays folders and associated text, one on top of another. Yuk! The Mac-like bar at the bottom of the screen points mainly to web locations rather than installed applications. Unfortunately a number of these links don't work! On the plus side, it automagically recognised my sound card, ethernet card and wide-screen and loaded drivers with no user intervention required. And the connection to the internet via my broadband router was silky smooth. I just plugged in the ethernet cable, typed in the GarfNet URL and it was there. No messing. And one must remember that at time of writing, it is a beta test, i.e. it's not ready for final release yet. Once these few bugs are fixed I think gOS will be a winner. I also think that users buying machines such as the Cloudbook pictured above with gOS preinstalled will love its smooth, Mac-like feel. Everex is hoping to shift shedloads of these little 1kg "ultra mobile personal computers" via Walmart. UK supermarket chain Asda is now owned by Wlamart so it will be interesting to see if they appear here in Old Blighty too. 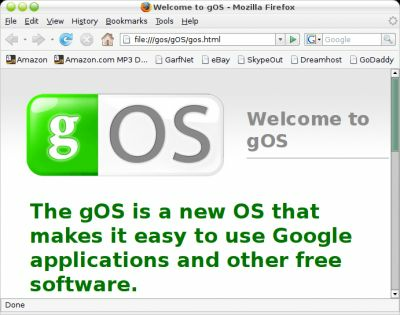 Finally, note the interesting disclaimer: "gOS is an independent open source OS devoted to Google applications and Google enthusiasts and is not affiliated with Google or their partners". 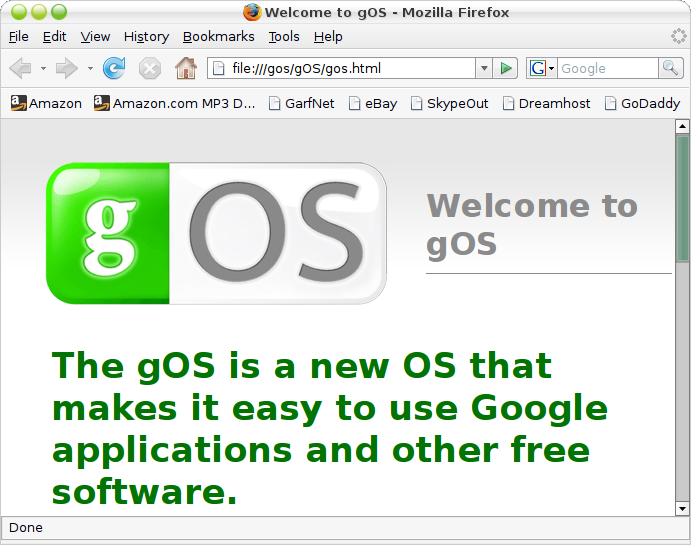 That is, gOS is not actually Google.